There are currently 3,627 users on this website. Can anyone help me with the identification of this austrian perfins? Perfins were once considered damaged stamps with little value, but they now have a strong following among many collectors. Not only "among" collectors. I know quite a few (including me) who don't collect normal stamps, just perfins. But the "damaged" view is not gone for all. One year ago I looked for a stamp shop in a little town in Germany, found one and asked, if they had perfins. Know what the owner said? "I throw them all away immediately." So if anyone has such rubbish, please let me know - they would perfectly fit to my over 50.000 worldwide (just perfins) collection! Tommtomm, keep that going, there is no right or wrong in the world of philately. I find perfins on covers especially attractive to have. Are any of these perfins missing in your collection? You are welcome ... but I wouldn't call it knowledge - it's more a "catalog having" thing. They are all quite common perfins, so no treasure so far. Maybe the EJW-33 could be an older Kreuzer issue, but it's hard to tell from the backside. Just out of curiosity, is there a way to tell if a perfin is genuine or forged? There are some hints ... first of all the holes. It takes quite an effort to get all holes exactly on place, and sometimes you can tell from the way the holes were made. 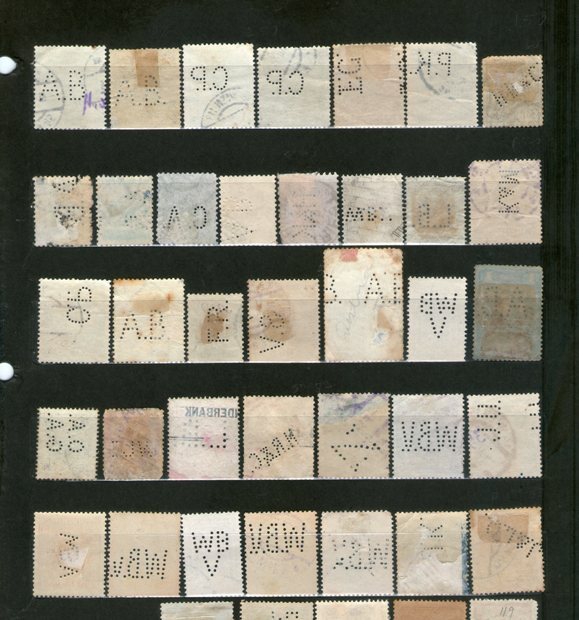 And a very good sign: most of the stamps had been perforated before cancelling. So the ink touched the inside of the holes. If you take a cancelled stamp and make the holes afterwards, the ink is just outside. The next thing: the perforation has to fit to the cancellation place and time of use. I once saw two very nice German perfins with an elefant and a swan on eBay. The only problem was, they were punched into German South West African stamps - where they never could have been used by those companies. Where you really have to pay attention, are scarce perfins (e.g. Finland). I only buy those from experts and known collectors. An Austrian perfin that is known just two times, and comes for 50 bucks from Eastern Europe ... well, you better go out and have a nice evening instead. That's a good point regarding the postmark ink appearing on the edges of the punched holes. It is probably safer collecting perfins with cancellations or those found on covers. Cover collecting is the safest way of course, but also the most expensive. Regarding the more common perfins - you get one stamp for app. 10-20 Cents, but no cover in good shape for less than 5 Euros. I was reading an old 2015 thread on perfins in this forum and someone mentioned that expertisers refuse to expertise Aussie OS perfin stamps, especially if the stamp is unused. I actually quite like the OS kangaroo perfins and I believe these used on covers must be extremely rare. That's the problem with Austrians/Australians - we don't know much about Australia, and vice versa. I heard about the OS thing once, but not enough to talk about it, sorry! 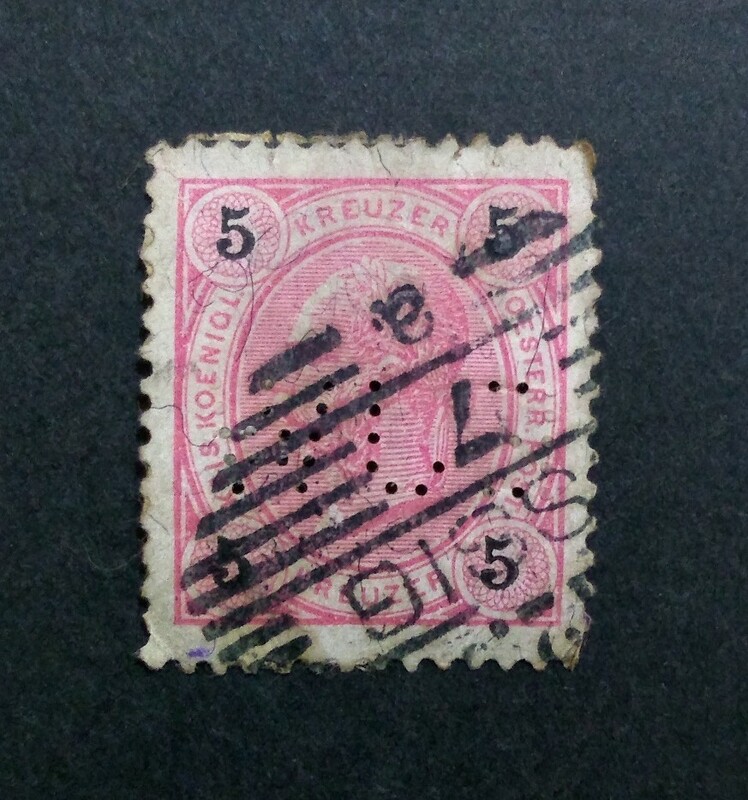 Unfortunately a very common stamp, but as I thought a Kreuzer issue - pretty old, and the cancel fits to the town of the company. Using time should be short before 1900. Do you collect straits settlement perfin stamps?